We, as members of the New York City Council, who represent immigrant communities throughout the city, are disappointed in your decision to deploy Secure Communities in New York City. Implementation of this policy will have devastating effects on the city’s immigrant communities. You should not activate this program in New York. 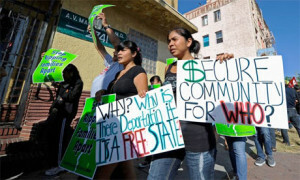 Yet your data shows that, in fiscal year 2011, 26 percent of all Secure Communities deportations were immigrants with Level 1 convictions, 19 percent of those deported had Level 2 convictions and 29 percent were individuals convicted of Level 3 crimes, which are minor crimes carrying sentences of less than one year. Twenty-six percent of those deported had only immigration violations. This dragnet approach may lead to the deportation of New Yorkers charged with minor offenses who have lived in this country for more than 10 or 20 years and who have deeply rooted family and community ties. This is wrong. As you know, in an effort to address the concerns raised by those affected, the Homeland Security Advisory Council’s Task Force on Secure Communities issued a report containing findings and recommendations designed to improve the program in September 2011. Advocates criticized your recent response to that report, which proposed to change little more than the way an individual accused of a traffic violation is treated, as falling far short of what is needed. We join in that criticism. For example, although the task force recommended that U.S. Immigration and Customs Enforcement improve the transparency of Secure Communities and strengthen accountability mechanisms, there continues to be limited oversight of the program and it remains far too difficult to make a complaint. In light of these facts, we cannot support the program or its activation in the city unless and until the issues raised in the task force report are addressed. Perhaps most importantly, it is clear to us that the decision to deploy this program in the city will create fear in immigrant communities and corrode the bond between immigrants and the city Police Department. In the city, we have worked to ensure that immigrants feel comfortable accessing local government — in particular, local law enforcement — to report crimes, seek assistance and support their communities. The deployment of Secure Communities will cause grave damage on all of these fronts. You should reverse your decision to implement Secure Communities in the city. This entry was posted in Press (New York) on June 18, 2012 by Ian.